Reposting this article to give some backdrop to the violence in Nuba Mountains. This is the context of Malik’s childhood, and the ongoing situation for the Nuba people. As the engines of the Sudanese Antonov bomber grew louder, everyone started running for their lives: mothers shouting for their children, the little ones screaming in fear. As the plane released its deadly payload, I watched as plumes of black smoke curled into the sky. Burned out of house and home, plagued by hunger, cut off from aid and relentlessly hunted from the air – this is what it means to be a Nuba civilian in Sudan today. Walking through the still smoking wreckage of burned-out Nuban villages, listening to the traumatised survivors, witnessing the deployment of illegal anti-personnel mines and cluster bombs, and seeing the destroyed food stores, schools and churches, memories of Darfur came flooding back. It is these scorched-earth tactics – first used against the Nuba in the 1990s, then refined in Darfur – that are preventing the Nuba today from farming and driving them to hide in cracks and caves in the mountains. The result is growing hunger for some 1.2 million affected Nubans. This chapter of the conflict opened in June 2011 with the disputed election of Ahmed Haroun (an indicted war criminal nicknamed the “Butcher of the Nuba”) to govern South Kordofan province. I had seen his handiwork before in Darfur. My warnings in 2004 were first ignored by world governments and then taken up only when, in desperation, I went to the media. The action that followed was too little too late. Though perpetrators including President al-Bashir were indicted for crimes against humanity by the international criminal court, justice and redress have yet to follow. Thousands of Darfuris continue to suffer in tightly controlled desert camps within Darfur and across the border in Chad, even as Chad’s President Deby cements an alliance with Sudan through marriage to the daughter of the Darfur Janjaweed leader Musa Hilal. The crimes against humanity in the Nuba stem from Khartoum’s declared vision of a Sudan that does not offer equality for its non-Arab and non-Islamic citizens. 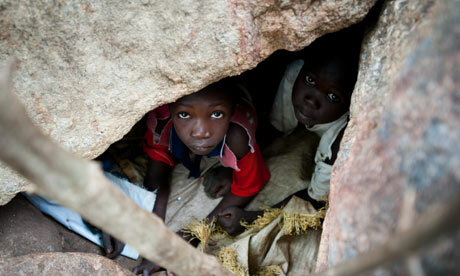 Sudan’s most marginalised ethnic African communities pay the price of such hateful intolerance and extreme repression. The world must overcome its torpor to avoid the greater cost of an inevitable later intervention, and I was heartened by the efforts of George Clooney and his colleagues to bring the matter to public attention in Washington last week. History teaches that palliative gestures towards Sudan don’t work. A transformation is needed, requiring concerted international engagement. The human rights emergency in the Nuba mountains requires a UN security council inquiry into crimes against humanity, along with a further referral to the international criminal court. Urgent help is needed through local Nuba structures if Khartoum continues to deny international access. Though it is difficult to execute the ICC’s arrest warrants for crimes against humanity, named indictees could be further sanctioned. And Khartoum’s capacity to wage war on its own citizens must be degraded by stopping official arms transfers and acting against companies that sell it military equipment. Moreover, the UN, African Union, Arab League and East African Community must speak with one voice through a credible joint envoy. Each of these measures has been successfully tried in other situations. Given the will, pulling them together into a coherent package for Sudan is the best hope for ensuring that the carnage of Darfur and Nuba are not repeated again. This month, I’m raising funds to help my Nuban friend begin his college education. This article is reposted as a contribution to my 6th Annual Birthday Fundraiser series. Posted by Jennie Joy on June 20, 2014 in Awakening, Development, Life and tagged African war child, ambitious, bachelors degree, contribute, donate toward a good cause, education, genocide, give back, healthcare in Africa, higher education, how can I help, individual donors, invisible genocide, MD, pay it forward, PhD, pursuit of higher education, silent genocide, south sudan, student, Sudan, thank you for helping, tuition sponsorship, Uganda, where is a good place to invest, worth investing in.